This project brings in elements of contemporary design with timeless materials. Upon buying this house, the yard was unusable. There was barely a path to the front door and the backyard was so hot the dogs didn't even want to go outside. The clients love entertaining and enjoying a glass of wine in their garden. We created spaces for their family and friends to lounge, eat and play. It was important to integrate vegetable growing and wildflowers to balance the hardscape. It is outfitted with a warm color palette of wildflowers, a cutting garden and plenty of seating. 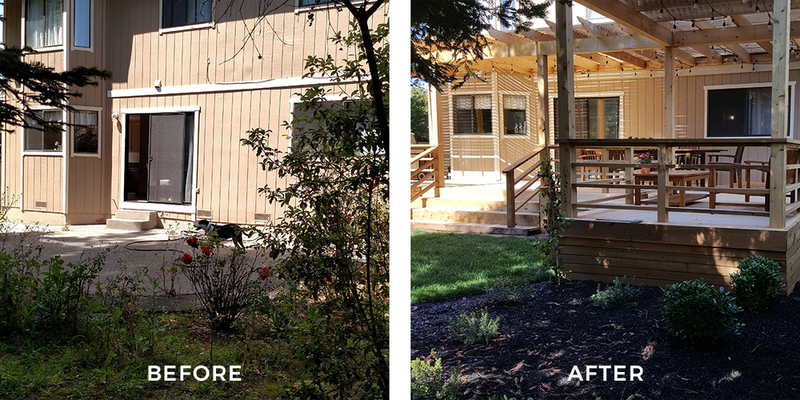 Create this dog-friendly landscape in your backyard with shade, water, and access that both you and your pups will love. The front door lacked focus. It was hard to get to and not very welcoming. We changed the circulation to make a beautiful formal entry and deck landing. The lines were intentionally created to draw the eye and visitors to the front door. The rock wall frames the oak tree to fit the space naturally, as if it were there all along. The main feature in the back yard is the elevated deck. It was designed and built to add an outdoor dining space and provide shade from the sun. Steps were added for easy accessibility from the higher level of the house down to the lower level of the back yard. This outdoor seating area is surrounded by lawn and angled in a way that allows people to enjoy the back yard, while having their back protected. Climbing roses will eventually create height behind. The side yard and back yard entry is a utilitarian and functional space. This client wasn’t sure she has a green thumb, so we placed the vegetable beds in a specific location so that if they didn’t thrive, they wouldn’t be an eye sore. Lavender will create an incredible display of color mid summer and add smell throughout the house.